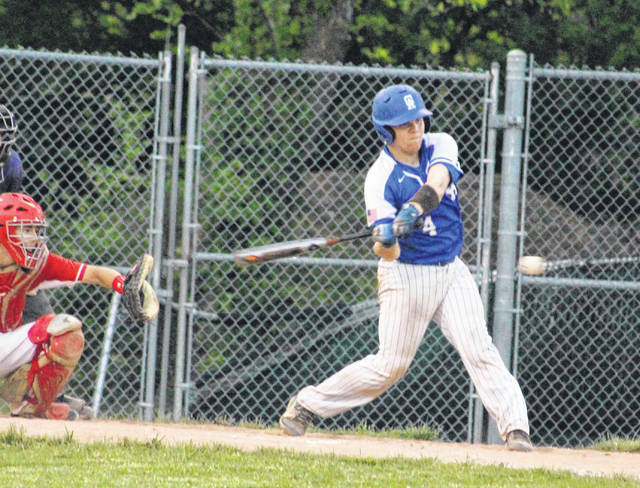 Gallia Academy junior Morgan Stanley (4) swings at a pitch during a Division II district semifinal baseball game against Hillsboro on May 14 at Athens High School in The Plains, Ohio. CENTENARY, Ohio — The Gallia Academy baseball team came away with four selections on the 2018 All-Ohio Valley Conference baseball teams, as voted on by the coaches within the league. The Blue Devils — who finished fourth with an 8-6 league mark — had two first team honorees, as well as the standard pair of honorable mention choices. Juniors Josh Faro and Braden Simms both represented the Blue and White on the first team, with Faro earning All-OVC honors for a second consecutive season. Senior Matt Moreaux and junior Morgan Stanley both joined Simms as first-time selections after being chosen to the honorable mention list. Barry Litteral of Rock Hill was named the OVC coach of the year. The Redmen won the 2018 championship outright with a 13-1 league mark. The Ohio Valley Conference does not select a player of the year. ROCK HILL: Cody Lewis*, Logan Hankins#, Landon Smith*, Kaleb Kidd. SOUTH POINT: Douglas Shaffer#, Brody Blackwell#, Drew Smith. COAL GROVE: Jeb Jones, Sam Angelo, Jordan Case. GALLIA ACADEMY: Josh Faro*, Braden Simms. IRONTON: Garrett Carrico#, Gage Salyers#. CHESAPEAKE: Trent Dearth, Evan Burcham. ROCK HILL: Jaret Bacorn, Kadin France. SOUTH POINT: Jonathon Henline*, Travis Dillon. COAL GROVE: Nate Harmon, Darin Bloomfield#. GALLIA ACADEMY: Morgan Stanley, Matt Moreaux. IRONTON: Joel Blankenship, Brycen Thomas. CHESAPEAKE: Bretton Martin, Josh Hansen. PORTSMOUTH: Isaac Kelly, Bryson Wallace. FAIRLAND: Gavin Hunt, Kyle Rankin. * — denotes 2017 All-OVC first team selection. # — denotes 2017 All-OVC honorable mention selection.